What Do The Rangers Fans Sing? The ground was mostly re-developed in the late 1970's and early 1980's with three new stands being constructed. Only the Main Stand (which was originally built in 1929) at one side of the pitch remains of the old Ibrox. This stand has also been refurbished and in 1994 a third tier was added to it. The impressive red brick facade of this stand was left intact (it is a listed building), which means that the ground has a great blend of modern facilities, whilst still retaining its historic character. The three relatively new stands are all good sized two tiered stands and either side of the Govan Stand, the corners have been filled, with seating in the lower tier and large video screens in the upper tier. Even though the Main Stand is larger than the other stands, the ground looks well balanced as the roof of this stand comes down to the same height of the others. The corners to either side of this stand are partly open, being filled with stairwells. There are also a couple of small electric scoreboards at either end of the ground. Overall a superb ground that is arguably one of the best in Britain. 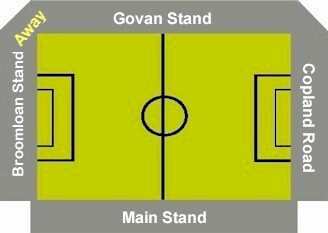 The Club have proposed plans to add a third tier to the Govan Stand. This would boost the capacity of Ibrox to around 58,000. However as of yet no firm timescales have been announced for this development to take place. Away fans are located in the lower tier of the Broomloan Stand, towards the Govan Stand and the bulk are located in this corner of the ground, below one of the large video screens. The facilities are fairly good in this area, as well as enjoying a decent view of the playing action. For big games such as the Old Firm derby, then the whole of the Broomloan Stand can be allocated to the away support. Although the ground itself is great, I found Ibrox to be quite intimidating. I would advise that you exercise caution around the ground and to keep club colours covered. Although most games sell out at Ibrox, tickets can be bought for most games, as long as you call the ticket office at least a couple of weeks prior to the fixture. Most bars around the vicinity of the ground are normally very crowded and not particularly away fan friendly, so it may as well be an idea to drink in the city centre before moving onto the ground. However, The Albion on Broomloan Road by the ground, has been recommended by some away fans. James Prentice adds; 'Away supporters tend to head for bars towards the Centre of Glasgow, as there is less chance of any hassle than when around the ground. For Rangers fans, there are several good bars to be found around Ibrox. There is the District Bar on Paisley Road West, which is an excellent, typical Glaswegian pub, and the Louden Bar, which is just around the corner - a Rangers fan's heaven and a real Rangers pub. The Stadium Bar on Copland Road is OK. There are also chip shops and a plethora of chip and burger vans around the ground of matchdays, as would be expected. Also, there is a relatively new caf� in a car park opposite Ladbrokes' Book Makers on Copland Road which serves good meals at cheap prices'. Leave the M8 at Junction 23 and head towards Govan/Clyde Tunnel on the A8 Paisley Road West. You will come to the stadium on your right after about a mile and a half. The roads around Ibrox become pretty congested, so please allow some extra time for your journey. Street parking. prefer to use Cessnock Underground Station on Paisley Road West, as fewer people seem to use it on a matchday. Turn out of the stadium and go left on to Edminston Drive, and the station is about five minutes' walk away after the road joins up with Paisley Road West (Adult single tickets are about 80p). While it is a tiny bit longer to walk to Cessnock, you may well stand a better chance of getting on the Underground more quickly than at Ibrox. Buses also run along Paisley Road West, and can take you right into the City Centre every couple of minutes. Getting off at Bridge Street is about 90p Single and is a two minute walk over the River Clyde for the Centre of Glasgow'. Otherwise if you are feeling particularly brave you can embark on the 40 minute walk back to the city centre. Govan West Corner: Adults �22, Concessions �12. For the fixture list click here (to take you to the BBC Sports Website). No not one and there never shall be one. Me and ma wee pal Joe! We love to see the Rangers score! Thanks to Peter Pirie, Allan Hamilton & Stuart Maclean for supplying the song information. The Club normally offer tours of the ground on Thursdays, Fridays & Sundays. In the school holidays these are offered daily from Monday to Friday. The tour lasts around 90 minutes and costs �7 for adults and �5 concessions. Tours can be booked by calling 0870 600 1972. If you require hotel accommodation in the area then first try a hotel booking service provided by Football Hotels who are powered by Activehotels, who specialise in locating accommodation near or within a short travelling distance of the football ground. They also have the added advantage over some other hotel booking services that you pay on departure. Yes this site will earn a small commission if you book through them, but it will go to help with the running costs of keeping the Guide going. To access their Glasgow Rangers page click here. Alternatively there is a similar service provided by Superbreak in conjunction with Harvey World Travel. To access their service click here. Framed Share allow you to buy a genuine share for someone else, which you can then give to them unframed, or in a frame of your choice. The recipients name will be on the share certificate, which shows that the person is now a shareholder in Glasgow Rangers Football Club plc. As a shareholder that person will receive the annual accounts of Glasgow Rangers Football Club plc and allow them to attend the Annual General Meeting of shareholders of the Club, where the Clubs senior officials attend and take questions. To find out more on how to purchase a share in Glasgow Rangers Football Club for yourself or someone else click here. Copyright � Duncan Adams 2007. All rights reserved.